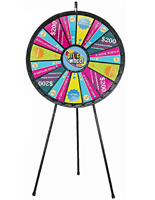 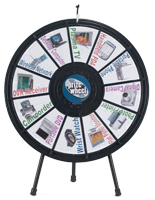 These adjustable prize wheels are inexpensive and fun promotional tools! 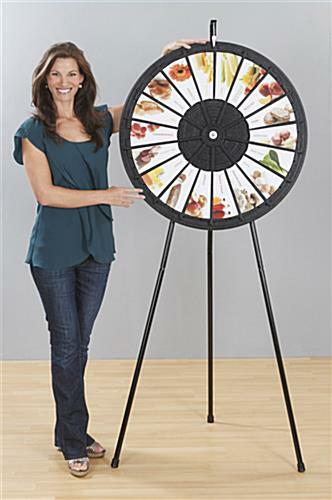 The freestanding award spinners, called games of chance, measures 6' high when it is converted from tabletop to floor stand use with its detachable legs. 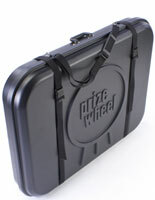 The gaming products, prize wheels are great tabletop games that also have rubber feet on the bottom of the smaller tripod to keep it place when used on a table. 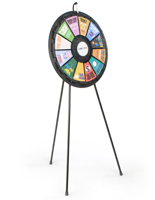 The spinner itself is 31" in diameter and fabricated from durable PETG plastic with legs that are made of high-quality steel that has been powder-coated. 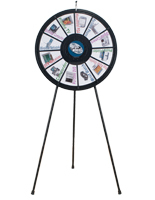 These prize wheels have 18 slots that allow owners to insert custom signage for a large selection of award options. 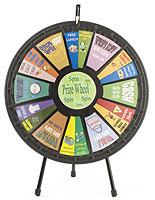 The gaming spinners give vendors the chance to use their own computers to create personalized prizes for each event. 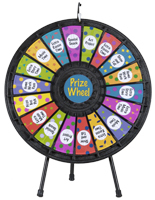 The lightweight prize wheels, called portable gaming pieces, have printing templates that are found on this page for use with Adobe® Illustrator® or Microsoft® Word. 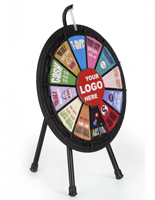 Custom logos or graphics can also be added to the center of the spinner for an even more personalized marketing tool.